Like a camera that had been stepped on and would never take another in-focus picture. It’s hard to know what to attribute to what, but I think food was a big part of it. The short version is that I felt moody the day after Thanksgiving and horrible the day after that but that, by dropping expectations and approaching self-care as priority #1, I got better and climbed up to a better place by Saturday evening. The longer version starts further back, at least to last Thanksgiving. Maybe it’s even further to three Thanksgivings ago, when I had some challenges with visitors and perhaps made some negative associations. I would do well to try to clear those! What I am sure of is that last year I struggled emotionally and mentally after the holiday. I chalked it up the following week to the fact that I was about to menstruate, which occasionally brought moodiness and sometimes GI upset. I recall being low blood sugar and eating oatmeal last year and then having such stomach pains I decided then and there I would be going grain-free asap and that I would start the Autoimmune Paleo (AIP) protocol come January, after we were back from travel. I also decided I was felt bad enough to justify some testing recommended by my health coach to see if I could figure out what to prioritize. I knew there must be more food issues but didn’t have the time, patience or energy to trial-and-error it all. In December, I took the ELISA ACT Lymphocyte Response Assay test. My results, which came in just a week or two, listed pumpkin and turkey on my moderate list for delayed sensitivity. I was supposed to avoid these foods for 3 months, and the foods on showing a strong reaction for at least 6 months. On my strong list was cow’s milk, which I haven’t for years, and olive. I started avoiding all these foods immediate. Nightshades were already being avoided. I was already gluten-free and dairy-free. Come January, I eliminated eggs and nuts, without much obviously noticeable improvement at first but certainly with negative reaction when I first tried cheating two months later. The test is pretty expensive, so rather than repeat it, I’ve just kept avoiding the foods on the list. The jury is still out about olive; I have had some here & there but feel like my face gets flushed when I just cook with olive oil at home for the rest of the family, so I’m not in the habit of using it for myself. But turkey or pumpkin I’ve avoided since last Thanksgiving, even though pumpkin pie is a year-round food at our house. As the holiday came around again this year, I decided I would try them both. I mean, it had been 11 months! And I was feeling so much better since I had begun treating reactivated Epstein-Barr and methylation issues. I tried to approach the meal without fear and just with enjoyment. I happily rubbed the turkey with herbs from our garden. I even put a dollop of maple syrup and molasses into my personal pumpkin pie and ate it with two small spoonfuls of coconut ice cream. Livin’ large, I know. Trust me, those are big steps for me to take after past negative experiences with sugar. The food was great, but I didn’t exactly feel grateful the next morning. In fact, I was kind of sluggish and grumpy. I was hoping we would meet up with the yoga studio group that was going on a walk to parks and be able to do one session with them and then just continue to play at the park. But we were running late, and they were running early, so we walked alone from the studio to the first park and then arrived just as they were leaving. If we’d even had three minutes, that might have been just enough, but it was kind of a bummer how it happened. The teacher of the next stop was one we knew from past family yoga classes, and she offered that she would be teaching at the next stop. We’d be airplanes! My daughter was conflicted, wanting to stay and play but also to continue on with the yoga group. I knew she’d get too tired on the walk to the next place; it was too far and I didn’t have the wherewithal to be perky and cheery. We might make it there but I expected from past experience that making it back would be unpleasant and difficult. My son wasn’t a total jerk, but he did clearly see this as a fail and just wanted to play at the park. He’s been kind of resisting my attempts to involve him in yoga and meditation. I had really hoped this group effort would be fun and different, and enticing. Not so. I sort of shrugged my regrets to the people who said hi to me, expecting us to continue on with them. 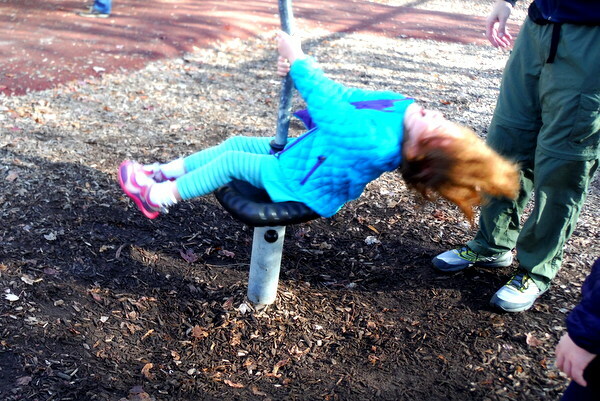 I ushered my kids toward the park and died a little inside when my daughter started equivocating, “I don’t like planes anyway” and something to the effect of not being good at yoga. My husband took the kids into the park, and I walked around the grounds sobbing. I was mad at my family members for contributing to us being late. I was mad and ashamed of all that is not as I wish it were about our family. I was frustrated about control: wishing I had it over things I don’t, wishing I could muster it for other things and really show up for my kids and my partner. Everything felt blurred together in one big cloud of failure. The kids did eventually have fun. It was a gorgeous morning. We all benefited from getting outside and out of our neighborhood. 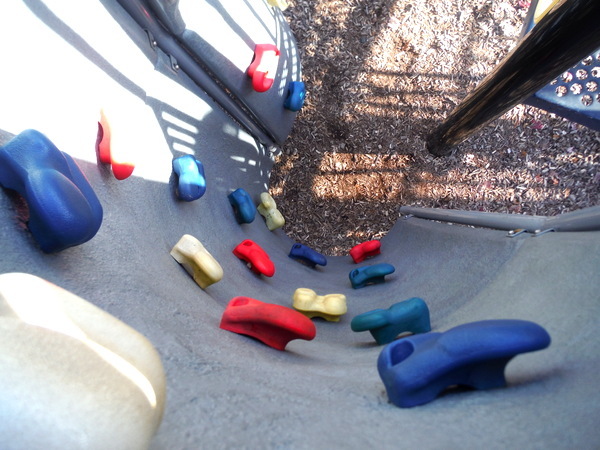 Both kids enjoyed spinning and climbing and playing. I even climbed the little rock wall. It was good to have a change in perspective. But still, it wasn’t the yoga and community connection I had hoped it would be. My poor children. Is it any wonder why my daughter went on to act so difficult through the day? We thought maybe she was ill; she was complaining of a headache and an eye ache whenever she wasn’t engaged in an activity. But other times, she was fine. I’m sure seeing her mom lose it and not knowing what to expect did not serve her well! At one point, she was driving us so nuts that I suggested I walk her in the jogging stroller so she could just relax. She wouldn’t lie down at home, and it was still a beautiful day out. I really, really wanted to get some exercise. My husband said he thought he’d take her in the bike carriage; he really wanted to get out to exercise too. I didn’t want to be gone from the house for long while my son was playing at a neighbor’s, which he’d already been doing for over an hour, so, as my husband and daughter headed off on their bike ride, I walked over to give my son some water and a banana and to tell him I would be out on a short walk. I would leave the back door open if he wanted to come home, and I wouldn’t be long. What I really wanted to do was run. Maybe it’s safe now, I thought. I’ve been doing yoga daily, I’ve been doing the elliptical several times a week. I’m not as weak as I was. Sure, I haven’t been doing lots of the core exercises that would be most important, but I’ve done a few. I was gone for a total of 20 minutes. I did little spurts of jogging for a minute or so at a time, probably comprising about 10 minutes of jogging. Years ago — before my daughter’s relatively easy homebirth managed to dramatically change my body — I didn’t feel like a run counted if it was less than 40 minutes. I needed that length to get to a meditative space. After her birth, running just felt wrong in my pelvis, and a physical therapist explained why almost three years ago. She’s cautioned me against much running and risking prolapse or injury because of a combination of my diastasis recti (abdominal separation) and weak core, my tendency toward misaligned pelvis and my weak pelvic floor plus the inflammation and gastrointestinal issues I initially sought her help for. Much of that has improved, and my legs and core are stronger now, but more regular and targeted core work would still be advised. It felt good at the time to get out. I showered and actually washed my hair, feeling a little taste of what it used to be like when, before child #2, I would go for a long run in the afternoon while my son napped. We got ready to head out to a tree-lighting ceremony preceded by dinner out. Everyone made it through the meal fine, but my daughter’s complaints about her forehead aching came back, and this time she started complaining just before we left that her eyes were hurting. Still, we walked in the balmy night the three blocks to the town square. There were lots of people out, and the trees lining the street were adorned with twinkle lights against the already-dark-at-6:00 sky. The square was packed, and the mics were terrible. We heard some city council folks speak, but the performers could have been down a well for all we knew. My daughter complained she couldn’t see anything. Neither could I, except the lights reflecting off the pool in front of the low stage. Blur was the theme of the day. My son was annoyed with his sister and with the crowd and asked to leave. We started walking and managed to make it closer to the stage and could hear and see a little of the action. I held up my nine-year-old son for about a minute and a half. 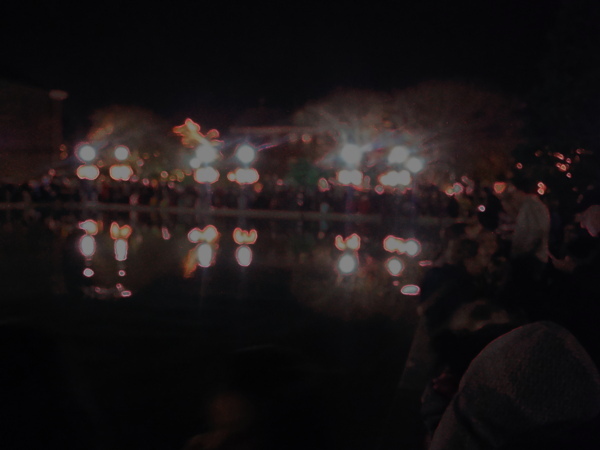 Finally, it was tree-lighting time. It was not super exciting to see, but at least it felt like closure. Daughter complained on the way home about her eyes and seemed to fall asleep, which is not what we were going for. We hoped for a transfer, but no dice. She was awake. Still, we went upstairs and moved decisively toward bed for both kids. But goodness, she was a wreck. In order to pave the way for sleep for my son, who had played a ton outside and was clearly tired, I quickly got myself ready for bed and took resistant girl downstairs to the guest room to lie down with her. I knew if I went to bed with her I would break my daily blogging streak, but it just had to happen. She could have just been having a delayed reaction to Monday’s craniosacral treatment; sometimes it takes a while for that work to integrate. But I was more concerned that she was getting sick, and sleep was the most important tonic for that. She didn’t want to lie down with me and would not stop screaming until I pulled out a trick my mom used with me that I think I have never used with either of my kids: writing on their backs. One of the benefits of having an early reader is all the things you can do with this letter fascination. I drew “I” on her back. She calmed down immediately. But she didn’t get the letter, so I said I was switching to lower case and drew “i.” I then went on to spell “love you.” She was totally into it and then wanted to do me. It was a trip to remember back to being a kid. I tend not to recall the intimate moments I spent with my mom, and this was a good reminder of what she gave me then. What she also gave me, some 35+ years later, was a calm moment with my daughter after a storm that seemed to come out of nowhere. My body ached. My husband asked if my legs were so and the answer was an emphatic no. It was my whole core that felt wrong, broken, crushed, inflamed. From the food? From the jogging? From picking up a too-heavy child? From 11 hours in bed on a soft mattress? I worried this would become the new normal again, but I’d had such a nice long taste of feeling better, I hoped I could pull it through. I had contemplated our family volunteering to deliver meals that morning but had never committed. I felt a little guilty but also relieved since I needed to go inward, to drop everything and heal, which was easier for not having anywhere we needed to be. I made fresh juice – just-picked parsley and beets with green tops, romaine lettuce, carrot and ginger with lime. I sent my kids to the park with a neighbor who offered and left them there after checking on them and seeing the entire neighborhood out on such a warm morning. I ate late, but mindfully. I took a bath in tons of magnesium flakes. I hardly moved the whole time, at least a half-hour. I wanted to disappear, to not have to walk out to my children and be a mom who is either not functioning or who is so busy trying to over-function that she doesn’t make time to just breathe with them. Or get them to count their blessings. Or any number of other things that would be good and grounding, especially around Thanksgiving. Then I rubbed some coconut oil with DigestZen on my belly. I drank Pukka Cleanse Tea with fennel, nettle and peppermint. At some point, I saw my husband reading the book my therapist had recommended we read together, How Can I Get Through to You? Closing the Intimacy Gap Between Men and Women. And at some point he thanked me for getting that book, which told me he understood why I’d said I thought it would be useful. Later, while my daughter watched a National Geographic video on my laptop in our front office, worked alongside her, going through papers and dealing with clutter that had needed attention for weeks. When a neighbor invited her over, my husband took her down the street. Later, when she got dropped off, I thanked my friend and started crying telling her how cruddy I had felt. She’s been going through some health challenges, too, and had recently asked me for advice. I felt compelled to share that it’s a process with twists and turns, and surprises. Just that act of talking helped. Then I stayed outside and raked while my daughter played with a different neighbor for a short while. And that helped. I didn’t hurt so much anymore, not in my middle and not in my head. My husband helped with dinner, after which he asked a question about the end of the Harry Potter series, and I rather gleefully picked up the book to read out loud. Reading the series with my son has been a fascinating journey for me these past few months. I read with expression. I added comments about how it always is that there is more than what we think we know, and our blind spots can be our downfall if we can’t at least acknowledge that we have blind spots. He looked at me in a way I feel like I have never seen before and told me he loved me and that he loved to hear me read. Considering where things have been in our relationship lately, that was huge. Maybe he’s said nice things like that before, as he later said he thinks he has, but this was so genuine. I knew he meant it. And I hadn’t been looking for it. It was just about joy and sharing connection to ideas that are beyond ourselves. And also totally about ourselves at the same time. It was a scary 36 hours. But it was also instructive. I can rebound. Pain doesn’t have to last forever. Sleep helps. Turning inward is like putting money in the bank. At the same time, reaching out to share lets the hurt disentangle from my notion of self. It took some angst to get there, but I finally found my gratitude.